Voice Mobile has introduced versatile Smartphone for its valued customers of Pakistan. This is mind-blowing hand-set has launched by Voice Mobile with astonishing features. It gives an amazing look in black color with wide display screen of 4.5 inches. It is providing latest incentives in this hand-set like dual-sim, Wi-Fi, FM, Radio- Bluetooth and many other features. Voice always brings hand-set with reasonable rates and the price of Voice Xtreme X3 is also very low for buying. This is such a cheap Smartphone has introduced by Voice in Pakistan for using and it gives all facilities of Smartphone in this launched cellular phone. It is providing Quad-Core processor system of 1.3 GHz and Android operating system is available in this Smartphone. This hand-set is giving 8.0 mega pixel rear camera options in this hand-set for making videos and capturing photos with high quality camera service. It is also giving an option of 2.0 mega pixels front camera for using video communication and taking countless selfies. It is giving a platform for using Smartphone in reasonable prices and many cellular operators who really like for using Smartphone are attracting for buying this hand-set.It provides 3G technologies usage in this hand-set and customers can use 3G technologies after buying this product without facing any issue. 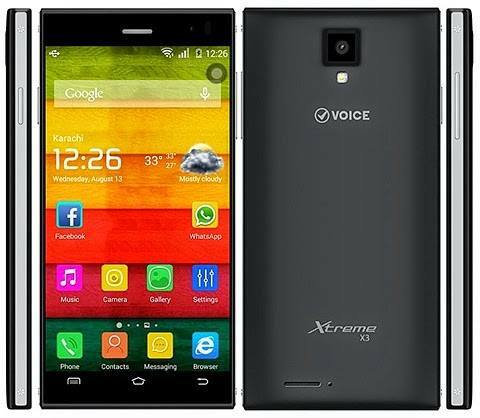 To get more details about Voice Mobile Xtreme X3 is mentioned as below. Memory: 8 GB built-in memory. Rear Camera: 8.0 mega pixels. (Flash-Light). Front Camera: 2.0 mega pixels. (Auto-Focus). Display Colors:OGS Display and IPS Display. Bluetooth, USB, Wi-Fi, GPRS, EDGE, WLAN. Audio: Mp3, WAV player, Stereo FM-Radio, 3.55mm audio jack, Mp4, WMV player. Messages: SMS, MMS, E-mail, Push Mail, IM. Ringtones: Mp3, Mp4, Sound-recording, Polyphonic tones, Downloadable. Other Features:GPS support, Predictive text input, Speakerphone, Document viewer, Touch-focus camera. Latest Features: Multi-touch display option, SNS integration, Photo editor, IPS + OGS sharp display, Media-Tek MT6582 processor, HDR camera, and 16M display colors.